Sharps are generally defined as any Item that can prick, slice, or penetrate the skin or can puncture waste bags and cardboard boxes that could potentially spread infectious agents- specifically Hepatitis B (HBV), Hepatitis C (HCV), and Human Immunodeficiency Virus (HIV). 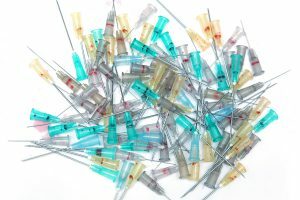 Medical Waste Pros offers sharps disposal services from reputable local providers. From supplying containers and mail-back systems for the safe disposal and transport of sharps to regularly scheduled pickups, our professional contractors will help ensure you’re compliant with all local, state, and federal laws. Medical Waste Pros will connect you with a safe, reliable local Sharps disposal provider to help you purchase a Sharps Disposal Container or schedule pickup and disposal for Sharps items. They can recommend the best disposal system for your needs, from a mail-back system to regularly scheduled pickups. To get started, fill out the form to the right, or give us a call at (888) 755-6370. Within minutes, we’ll get you free, no obligation quotes within minutes!